and his troupe present a "process-memoir"
this week at Tisch's Jack Crystal Theater. This is not really a formal review of the "process-memoir" offered, last evening, by Johnnie Cruise Mercer/TheREDprojectNYC at NYU Tisch School of the Arts's Jack Crystal Theater. I write merely to ask you to consider going tonight for its final showing. And, yes, I know this has been the season from hell with multiple dance events stacked atop each calendar date like acrobats forming a circus pyramid. But still, go see Mercer's to ascend past numbness and witness birth. You'll have fun, you'll see some amazing performers, and you'll experience surprises I'm not going to reveal. Mercer treats his audience like frogs in that pot of water that starts off nice-and-comfy then gets progressively warmer and warmer. I had just one problem: this evening--reportedly the third part of a multi-part "process-memoir" moving towards a two-part work...well, maybe you get the picture--feels very long, stuffed with stuff in need of judicious pruning. Excess, though, does seem to be a necessary Mercer ingredient. You'll see what I mean. Take your buddy who thinks they/she/he can't get into dance or simply get it. Take your mate who only makes time for pop culture. Take your woke co-worker who will surely appreciate how art can simultaneously entertain and question that entertainment. Take anyone capable of having their mind blown. And then, let's all wait and see what TheREDprojectNYC will make of all of this. 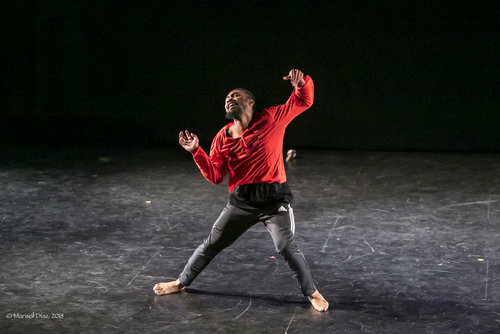 Mercer calls his performers "company partners" and "a community of artistic dare-devils," and so they are: Shanice Mason, Thomas Tyger Moore, Nicholas Rodrigues, Erica Saucedo and collaborating artist Adrianne Ansley. to ascend past numbness and witness birth. concludes this evening with a performance at 7:30pm. For information and tickets, email theredproj.company@gmail.com or click for the Facebook event page.